The inhabitants who lived in poverty here on the outskirts of Central Yharnam seem to have all but abandoned this vast graveyard. But be wary. Surely you are not completely alone here. 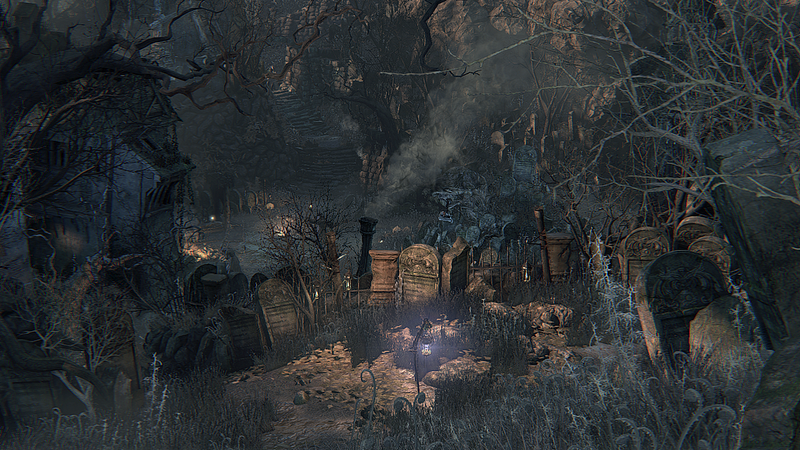 Since there’s no shortage of corpses in Yharnam, the local graveyard is very large. Charnel Lane is filled with various carelessly placed gravestones. It’s easily located and is lined by graves big and small. It’s an ominous and gloomy place surrounded by a very poor district where the cultural level is also quite low. It’s currently deserted, but what lurks under the earth? Mad Ones: Even greater threats can be awakened in Hemwick if you venture into this area with 15 or more Insight after nightfall, because only then will the fearsome Mad Ones crawl forth from their blood portals in the ground. These enemies are very fast and aggressive, so whenever possible you should try to attack them while they are still appearing, and always fight them away from other enemies. Rune Workshop Tool: If you follow the narrow hallway along from the back of the boss room and enter the small room at the end you can find the Rune Workshop Tool on the body of one of the Witch's victims. With this in hand you can now return to the Hunter's Dream and make use of it at the Memory Altar inside the workshop to memorize the inscriptions of powerful Caryll Runes. These runes have many different effects and you can memorize up to three normal ones at any time, with a fourth position reserved for rare Oath Runes. Wandering Nightmare: Wandering Nightmare in Witch's Abode has to be scared off, by breaking destructable objects like barrels, to drop down in the entrance room of Witch's Abode. Friendly Carrion Crow: In the nest of crows after the elevator shortcut and before Stables you can find one Carrion Crow which is not hostile and will not attack you. Sinister Bell Ringer (Online): Bell Ringer is located at Stables 2F across the rafters. When “bell-ringer woman” is present, versus PvP invasions are possible. Insight: If you venture into this area with 15 or more Insight after nightfall, because only then will the fearsome Mad Ones crawl forth from their blood portals in the ground. Word Charnel: Connected to term charnel house - which is a vault or building where human skeletal remains are stored. They are often built near churches for depositing bones that are unearthed while digging graves. Charnel houses were also used specifically for mortuary services, they offered privacy and shelter as well as enough workspace for mortuary proceedings. These proceedings included cremation as well as defleshing of the body before the cremation. Once the houses had served their purpose, they were burned to the ground and covered by earth, creating a sort of burial mound. The term can also be used more generally as a description of a place filled with death and destruction. Kill the Witch of Hemwick to reach the room containing the Rune Workshop Tool. Return to Hemwick Crossing after obtaining the Cainhurst Summons from Iosefka's Clinic, and then approach the large obelisk in the middle to summon the carriage that will take you to Forsaken Cainhurst Castle. Rifle-carrying Huntsmen and their Hunting Dogs guard the woods outside Hemwick Trees often obscure their positions, so you'll need to be extremely cautious when moving through the area The largest concentration of enemies is on the right-hand side of the woods, so it's best to stick to the left as much as possible if you just want to get through the area. A Hunting Dog patrols near the entrance to the woods, so wait for it to spot you and lure it back. Doing that should ensure that you don't wander into one of the Huntsmen's lines of sight. If you walk along the left side of the area you can easily sneak around behind the first Huntsman and kill him before the nearby dog spots you. After killing the beast, quickly run and use the large tree further along for cover, while you close in to deal with the enemies on the other side of it. From there, run straight down the path and try to get close to the patrolling group before they spot you, so you can take them out quickly. Once they're down, go through the gate at the end of the path and activate the Hemwick Charnel Lane Lamp. A few Hemwick Grave Women are in the village square, but if you're patient and tactful it's possible to take them on in small manageable groups. When you first enter the square you'll see one kneeling down near a grave, while another dances around near the statue in the middle of the area; getting close to the kneeling enemy will cause the one behind to come running towards, you so take that one out first, and then quickly kill the one that was kneeling before it can attack. As you get close to the statue in the middle, another Grave Woman on the other side should spot you and come running, and a second one that's hiding behind the statue won't be far behind her. If you move backwards while they approach and fight them near the front of the square you can take them out one at a time without alerting the other enemies. Once they're both down, sneak up behind the enemy standing near the guillotine and finish her off. If you head around to the right of the large statue in the square you'll find a set of wooden stairs leading up behind the morgue building, where corpses are awaiting burial. If you look closely at the back of the building you'll see that one of the boarded up windows has light shining from it, and if you approach it you'll be able to speak to the occupant The path leading away from the back of the building will take you to the bottom of a shortcut elevator, but you'll need to activate it from above before you can use it. Running straight into this area can be extremely dangerous and you'll soon find yourself surrounded by enemies, so patience is the key to making it through safely. As you start heading up the first set of stairs, a Grave Woman will come running down - wait for her to come to you before you start attacking her. Come to a stop once you reach the top of the stairs, because a Hunting Dog will soon start coming down the furthest of the two sets of stairs in front of you, and shortly after that another Grave Woman will follow. The major threat here is a Grave Woman standing on the ledge ahead between the two staircases, because once you're in range, she'll start to throw Molotovs. If you hold your position at the top of the stairs, the patrolling Hunting Dog and Grave Woman will soon spot you and come running towards you, which allows you to take them on one at a time as they get close, without worrying about the Molotovs. Once they're both dead, run up either of the stairs and take out the Grave Woman quickly, before finishing off the remaining enemy and continuing up the next set of stairs. Before going too far up the path towards the gate, stop at the top of the first set of stairs and follow a small ledge around to the right to find a hidden item. A Huntsman's Minion patrols up and down the hill - fight it near the bottom, because a Grave Woman is standing on a ledge further up the hill and she'll start throwing Molotovs down at you when you get close. After killing the Minion, run up the hill as quickly as you can to avoid the Molotovs, and then double back along the ledge on the right and take out the Grave Woman. The gate at the top of the hill cannot be opened from this side, so you can ignore it for now. In this area you'll see another set of stairs leading down, but instead of taking them, walk along the narrow ledge to the side. At the end of the ledge you'll come to the top of a small alcove, where another Grave Woman is waiting for you to pass by below; from this position you can drop down with a plunging attack for an easy victory. A large number of Carrion Crows are hiding in the tall grass in this area, so keep your eyes trained on the ground while you explore and gather items; try to spot them early, so you can use jumping attacks to take them out easily. The top of the elevator that leads to the Village Square can also be accessed from here, giving you a nice shortcut between these two areas. If you only ventured into this area to gather enough materials to upgrade your weapon before going to another area, then this is also the ideal time to head back to the Lamp. Be very careful as you continue along the cliff side - as you round the corner near the bridge, a Grave Woman will ambush you from the side and try to knock you off the cliff. To counter this you should either be ready to evade the instant you see her, or angle yourself so that if she hit you, it won't push you off. On the other side of the nearby bridge you'll see a Huntsman's Minion patrolling in front of the Stables. Try to lure it back across the bridge towards you crossed and fight it there, because another Grave Woman will exit the Stables once you get close and fighting both can be quite dangerous. There are a few enemies that will try to ambush you in the Stables, so you should proceed cautiously and always check your surroundings. A Grave Woman is laying in wait in the second stall on the right as you enter, so attack her quickly to kill her before she stands up. Near the end of the stalls a Hunting Dog will come running from the middle of the Stables, so try to use one of the stalls to block its movement and attack it safely from the other side of the wall. Once the area is clear, head to the back of the Stables and climb the ladder to the next floor. The first thing to do upon reaching this floor is run straight ahead and kill the Wandering Nightmare before it can disappear. If you then turn around you can double back around the ladder and go down the stairs behind the wall to reach a set of beams crossing the floor below. Once you reach the other side, be careful as you enter the room, because a Wheelchair Huntsman is waiting around the corner to the right; quickly run and get to his side before he can shoot you, and then finish him off before he reloads. Once he's down you can gather up all the items and head back across the beams and exit the Stables onto the Rooftops. For the first part of the Rooftops you need to be extremely mindful of your positioning, because falling over the edge will send you plummeting to your death. Enemies will also try their best to push you off, so always try to stick to the wall on the left, so that even if you do get hit you will not get knocked back over the edge. After rounding the first couple of corners on the Rooftops you'll reach the top of a wall, where you'll see patrolling Grave Women with a Huntsman's Minion accompanying them. Watch their movements and try to lure the Grave Women towards you with Pebbles without the Minion detecting you, or lure the Minion first if he's closer and fight him away from the Grave Women. The order in which you kill them doesn't matter as much as making sure that you engage them separately to keep the fight manageable. Falling off the side of the wall is not quite as dangerous as falling off the rooftops, because there is solid ground not too far down, but you will land amongst a large group of Hunting Dogs, so it's best to keep your distance from the edge as you fight your way down the wall. At the end of the wall you'll come to a building that joins on to a tower, and you need to be careful as you approach the doorway, because a Grave Woman will lump out and ambush you when you get near. If you stay to the right of the doorway, her ambush attempt will usually miss and you can attack her as she recovers. There are two Executioners patrolling the area just outside the tower, and it's very important to avoid fighting both of them at once. The patrol route of one of them brings it very close to tower exit, so you should try to fight it in that area to ensure you're far enough away from the other one that it doesn't see you. The doorway of the tower is just small enough that the Executioners will rarely be able to fit through it, so you can use it to hold them in place and use hit-and-run attacks in relative safety. Once they've both been defeated, make sure you pull the switch to open the Village Gate, so that you can return to the Lamp if needed and have a quick route back again. The items on the bluff make for a tempting lure to draw you in, but to reach them you'll have to contend with a large pack of Hunting Dogs, and one wrong step can see you easily surrounded by them. If you move up just past the obelisk you should be able to draw a small group of the beasts towards you, and you can use the obelisk and nearby gravestones as cover while you separate and attack them. Further up the path you'll see a lone Hunting Dog, and again, let it come to you before you fight it, rather than advancing. Near the end of the path you'll see a final Hunting Dog standing next to a Grave Woman who likes to throw Molotovs; once the dog spots you, let it run towards you so that you can fight it outside the Grave Woman's throwing range, before finally moving up and killing her. With the area now clear you can go about picking up all of the items, but be especially careful when going for the one at the end of the broken section of road, because it's dangerously close to the edge and the footing is very uneven. There are a few items to pick up along this path, and while the first half of it is clear, once you get halfway up there are some enemies you'll have to contend with. A group of Grave Women patrol the upper part of the main path, and at the end of a small side path an Executioner stands in wait. If you don't engage the patrolling group and wait for them to start walking back up the hill, you can sneak along the side path and take advantage of the fact that the Executioner is standing with his back to you by hitting it with a charged R2 attack. You'll need to kill the Executioner quickly, because the noise of the battle will usually attract the patrolling group, and you don't want to face both at the same time. Similarly, if you were to go after the group first, the Executioner would come out of the side path behind you so you'd want to fight them as far up the path as possible to give yourself the most time. Before heading into the boss room, if you break the three barrels just in front of the stairs leading down, the noise will cause a Wandering Nightmare to drop from the ceiling nearby, and you can kill it for some extra Bloodstone Shards. The Mad Ones that you face during the fight with the Witch have very poor visibility, so as long as you slowly walk around the area, they will not detect you unless you get close to them. 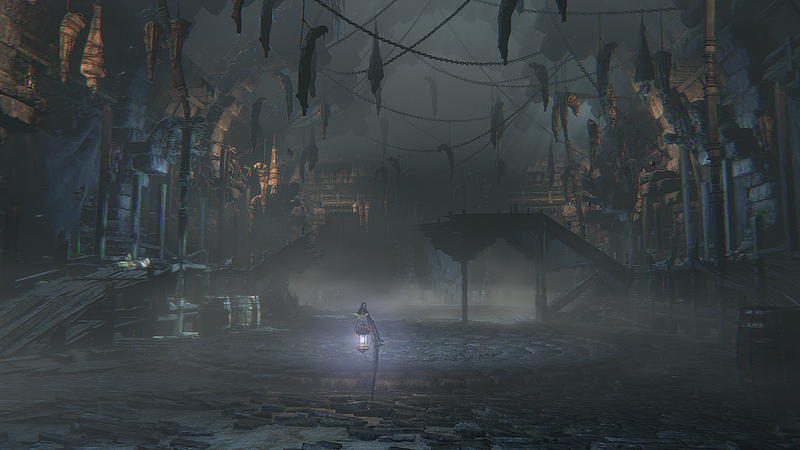 When you defeat the boss, the new Witch's Abode Lamp will appear Being able to return to this area will make the trip to the obelisk for summoning the carriage to Cainhurst Castle much quicker.